I wonder about erasing a floppy with a degaussing coil or a magnet near by. The field strength in the gap of a write head is tremendous. Can you really corrupt a disk by accident that easily? It’s not that it would specifically wipe it clean in one shot, but just make the difference between a magnetic 1 and 0 less defined. Same thing with VHS tapes… they will self demagnetize themselves over time. A lot of people stores their VHS tapes on top of, or right next to their TV. Every time they tuned their TV on, the degausser took a little bit out of their tapes. _on_ the TV would be particularly bad. The old tube technology run quite hot and heat is also damaging magnetic media. I doubt there were many people using vacuum tube TVs in the era of VHS tape. Also, many old vacuum tube TVs had rather large cases so the top didn’t get very warm. My kids all had their own 3.5″ floppy disks for working on our PC. My son’s kept going bad. I found out he was keeping it in a desk drawer…. with a bunch of magnets. I worked on a system where the prototypes were built in a standard PC housing, and we used the space for the 5-1/4 floppy & hard drives [under the 3-1/2 floppy drive] for a bulk 24V supply with a 10,000 uF filter cap. If there was a 3-1/2 floppy in the drive, the magnetic field from the transformer surge charging the cap would corrupt the data on the floppy. The fix was ridiculously simple – a piece of air conditioning duct work ‘tin’ was wrapped around the bottom and sides of the floppy drive to act as a magnetic shield. Back in the 30’s depression real Sn disposable beer cans were great for the beer and again for making stuff like soldered strip antennas stapled or nailed to barn beams and feedlines when Cu wire or even C/Fe barbed wire was too valuable. Now Sn(tin) is pretty hard to find as ‘junk’. I was never clear if they were a Sn galvanized Fe cans or all Sn. I never had corrupted disks but found a read problem with 25 prototypes that were all failing. When I went to look at the testing setup they were all lined up on a shelf next to each other. The video circuit and flyback from one was two sheets of plastic away from the floppy drive in the other. Too much electrical noise for the floppy read circuits even in the thin sheet metal of the drive housing. The test and solution was pretty easy. I pulled a couple of them about 6 inches apart and the tests started running clean. I had floppies from the days of 8″ to DSDD diskettes and laid them all over. On top of monitors or power supplies and don’t recall any problems with corruption. I had trouble with Zip disks. Maybe that is why they came and went so quickly. Anybody need a SCSI Zip drive? ZIP drives had other problems, unfortunately. Bad drives could scratch up a disk, and that scratched disk would mess up another drive’s read head(s). Reminds me of the guy who discovered uranium’s radioactivity due to having a lump of ore in a drawer near tubes of unexposed film. 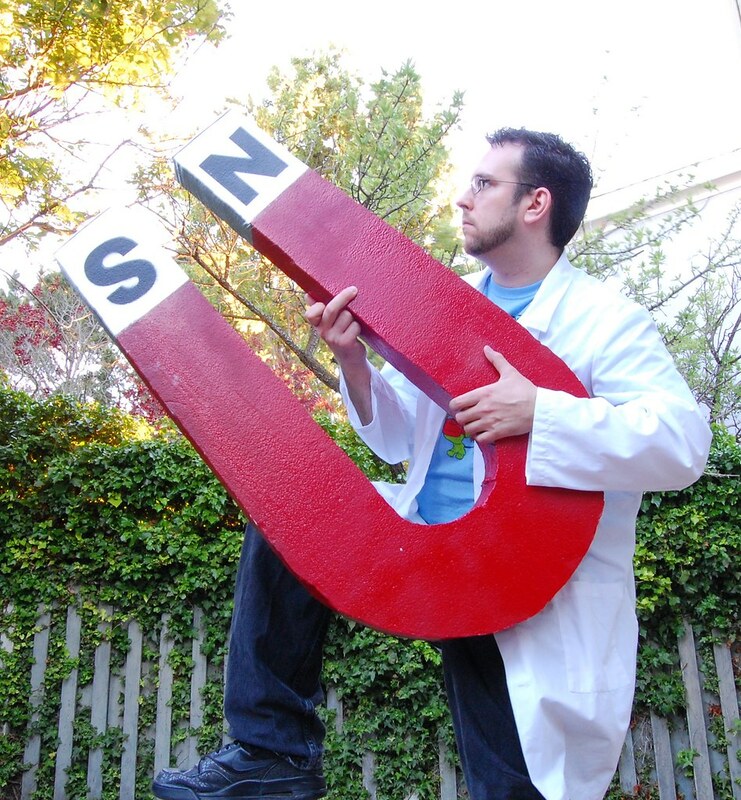 To act as magnetic shield, the metal has to be ferromagnetic. Was your ‘tin’ in fact some steel sheet metal? My absolute favourites are posts about errors which themselves have those same sorts of errors. My father has a story of the early days of computers in the (Canadian) government. They had a user that continually had data go corrupt on their floppy disks. They would go up and check things out, find nothing wrong other then a bad disk and clean desk. Repeated calls for bad disks were starting to cause a fuss(as she was reasonably important). One day my father happened to be going past her desk returning from other business and decided to drop by to see if things were working. He discovered that she was a polite person who made sure that everything was ready for IT by clearing her work area and getting all the involved media laid out and ready at hand. When it was an unscheduled visit things were different, including the floppy disks being held to the (very sturdy) steel desktop PC cases using fridge magnets. A quick note to her about the effect of magnets on disks and the problem went away. This was before most people could have been expected to hear about this, so it was not PEBCAK. Lesson: Sometimes you have to sneak up on your users when they least expect you. isnt that an urban legend? I know someone who did that, and I know the mutual friend he used for computer support. I got to hear all kinds of stories from her of his computer misadventures, including sticking a floppy to the computer with a magnet. Yes. Yes it is. Doesn’t mean nobody actually did that ever, but it does mean 99.99% of people who “have this funny story from a while back” never actually had it happen to them. You Sir, would be a very fine sysadmin! I seem to recall users keeping floppies in easy reach right under their monitor, either on top of their desktop machines or on the table for tower systems. I wouldn’t be surprised if that contributed to corruption. Especially for systems that were powered down often, to save electricity. Does anyone remember if CRTs degaussed when coming back out of standby? Some did– usually ‘newer’ ones that had the degaussing function under firmware/menu control (I had a big Nanao 21″ that would do that). On older monitors the degaussing circuit was typically a positive temperature coefficient thermistor setup that would fire once when the monitor was turned on and then would not trip again unless the monitor was turned off and the thermistor was allowed to cool down. It isn’t as strong as you think it is. And as others have stated, you don’t have to wipe it, just make the data unreliable. I have destroyed my friend’s IT homework once. By fooling around with a floppy disk and a magnetic latch of my calculator lid. So yes, it can be done. I really thought the magnet was too weak to do anything with that disc. Back in the early ’90s, I had an office at my University, and there were around 16 or so separate computer monitors attached to various systems in there. One of them was a 17″ Sony Trinitron – a giant beast of a monitor that was almost twice as deep as it was wide. When I hit the degauss button on it, it would make _all_ of the screens in the room wobble, even six feet away. Now it’s time to reformat my floppy again. This reminds me of one of the lab-device-attached computers when I was in grad school. Directly on the other side of the adjacent wall was an elevator shaft. Every time the elevator went by, the CRT went wonky. I had a 21″ sony with 5 BNC’s.. and it would also do that to monitors at least 3 cubes away. It was glorious. I had a IBM 5081-19 with three BNC connectors. Was such a pain to get running on a modern (15 years ago) computer. I could have gotten a gloriously huge (19″ or 21″, can’t recall) SGI/Sun monitor many years ago for all of $20, but it used the 13W3 connector (sync on green, I think) and at that point the internet wasn’t nearly as deep in terms of locating the proper video cable/adapter hardware (to get it to 5 BNCs and then to HD15), so I passed on it. Looking back, I still regret it a little. A few weeks later I found a more traditional 17″ monitor at the community recycling center that just needed the CRT yoke reseated on the pins… easy fix. Lasted about 8 months, then started to die, but the mfg warranty was still good(!) so I got a refurb replacement for the cost of shipping the old monitor back to them. Ended up giving that one away years later as it would not die (the degausser on that one had the most satisfying thump of any degaussing screen I ever used!). Good memories there. I had a dozen of these beautiful Sun/Sony monitors that I bought for $100 total. They had the 13W3 cables on them. I spent a day cutting off the 13W3 connectors on the end of the cable, and soldering on HD15 VGA connectors, including a capacitor in the connector shell to combine the horizontal and vertical VGA sync signals to feed the composite H/V wire bundled in the cable. Sold the monitors for $150 each after conversion. Still used one for myself until 6 months ago. Awesome CRT monitors…. Ahhhh…they weighed 75 pounds as my back recalls with a groan. We had 65 of them. I was SO glad when flat-screens came. I also remember a color laser we had in the shop. Thing was bigger than most computers in the day. Lol Yeah, add me to that list as well. Um, could we perhaps get a better picture of the Queen Mary? I don’t see the degaussing coil in that one. Or perhaps add an arrow to point it out? Something? I agree! I couldn’t see it. Can recommend the book: “Magnets: The education of a Physicist” by Francis Bitter from 1959, has a chapter about magnetic mines, degaussing ships and other magnetics during WW2. Also contains quite a lot about magnets and development. Thank you for fixing the pic! I’ll have more patience next time and not double post. 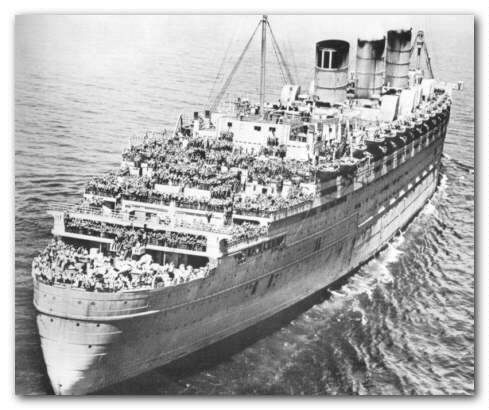 The degaussing coil was several turns of heavy conductor wire that was draped around the perimeter of the ship at/around the water line, and had a high current AC voltage passed thru it. Image is too big. Cannot post. I still have my good old 19″, 1600×1200 CRT monitor (guess it’s pretty huge for a CRT? ), currently working as the second screen to my iMac, because why not? It still works fine! And as I read this article I pressed the degauss button, so satisfying. The 2 or 3 stabilizing horizontal lines, once you noticed them you could not “un-see” them. Also you could bang the side and the aperture grill would vibrate, making a nice noise and a wobbly picture. More light. Less power. Good color. Those were the days. I was sitting in front of a iiyama Vision Master Pro 510 22 inch CRT. The beast grilled me with all the x-ray it had and was warming up the building so much that half Siberia started melting. In good days it had a fair image display, on bad days I hated it. Weight a ton, cost some huge bribe to get it and was overall a kwels-kid-in-the-block-toy. Had an office above a plasma physics experiment a few years back. Took me a few weeks to figure out why my monitor image suddenly jumped a few times a day every few days. My nearly beat me around the age of 6 or so when he found out I had taken a magnet and found that the TV set did weird things when I placed the magnet against the screen…. Thankfully a few on-off cycles later and the distortions cleared — Before he gave me my very own on-off cycle!!! Yea I loved playing with a magnet on a TV too, but since I also liked watching TV I never went too far. nothing like degaussing your leatherman then passing through metal detectors at various “secure” places and watching the consternation when they realize you are still wearing it. and BTW: some store anti theft devices use a frequency change LC circuit that gets degaussed when you buy something. That’s not how metal detectors work. I have to agree with dingus. Demagnetizing your Leatherman won’t make a metal detector miss it. If it did, nearly every stainless steel knife would pass right through, because you can’t magnetize them if you wanted to. It depends on the quality of stainless steel. There are alloys that can be magnetized. When you said this I thought of a bolt that is used to hold down a torroidal transformer because it looks like stainless steel but is a completely non-ferric alloy. On the other hand, stainless steel *is* ferric so it should be able to be magnetized?? I know many things, but I don’t know why high-alloy stainless is largely non-magnetic. Maybe nickel and chrome reverses the polarity? Cobalt again is used in very strong magnets. For this application I know only ordinary steel screws (galvanized). it does not matter for the transformer, if it is ferromagnetic. There is nearly no stray field in the center of the toroid. But you must never build a short circuit winding with this fastening bolt. Most metal detectors will detect nonferrous metals by eddy currents. In fact, great efforts have been put into discriminating ferrous from nonferrous. Which would you rather dig up, some nails, nuts and bolts, or a gold or silver ring? American coins are nonferrous. I always remember the slight BZZzzt of the TV and later colour monitor made when you turned it on. When we got our new computer in the late 90s it came with a huge ~20?” CRT – When I first plugged it in, the degausser in it was so horribly loud that I ran away thinking the thing was blowing up! A little know trick was that you can use an electric drill to degauss CRTs in the event that you don’t have a degaussing ring handy. Simply hold the body of the drill sideways against the Monitor / TV and pull the trigger for a few seconds and slowly pull it away from the monitor. That trick even worked on monitors that were so far gone that a regular degausser wouldn’t save them. My father repaired televisions for years – he used to use an ancient Weller soldering gun to degauss. My fathed used to fix TVs too. He has one degauss coil made by himself, around 30cm of diameter. Well, it worked very well… I used to turn it on and he started to make circles in front of TV, getting bigger and far. After that, I turned it off. I guess commercial coils are smaller. Sorry, i wrongly reported your post. My wife found a similar hack after my oldest found out how cool it was to put a magnet on the TV. Her trick was to put a magnet in the chuck and get it spinning from a foot away from the screen, move it in and “wipe” it across the screen then pull it away. Worked like a charm. Yup – the key is a moving magnetic field. It doesn’t take much to fix most magnet attacks. Apparently that is a real magnet for teaching purposes! Drag this through the ocean during WW2 and you could have cleared a path I suppose. Then again, I’m betting they did! This was a great article; I didn’t know about degaussing ships, that was news to me! When I was a small child back in the late 60s my parents purchased our first color TV. It was a huge console Zenith, “the quality goes in before the name goes on”. We had the TV for about a week. My dad wanted to show me some magic and held a magnet up to the TV for a second. The colors look really cool to a 5 year old. The next day when dad came home and turned on the TV to watch the evening news. To his surprise the screen was just a distorted rainbow of awesome color. My dad knew exactly what had happened and exactly who did it. I did not get punished. I guess that was my first hacking fail. You don’t have to wonder if the degaussing coils corrupted floppies. I did the experiments. 5-1/4 inch floppies take a weaker magnetic field to affect them. Same with Dual Density (DD) 3.5 inch floppies. Merely leaving them on top of a monitor was enough to damage them. It might take a few on-off cycle for the 3.5 inch to show damaged data. HD 3.5 inch floppies got their higher density partly by using tougher-to-magnetize/demagnetize ferrite. I had a small hand-held degaussing coil like the one in the article that would not cause obvious damaged, although I’d not count on that saving them. The same coil could completely erase DD 3.5 inch and any 5-1/4 inch floppies. All through the comments I was hoping someone was going to dismiss that theory, I was forever leaving floppies on top of the monitor. Use to be able to buy bulk erasers that did the job. Those bulk erasers are yet another thing. A TV degaussing coil didn’t seem to cripple HD 3.5 inch floppies, but a bulk eraser would erase anything using magnetism to store data. Even demagnetize a hammer or screwdriver. I keep a couple of those bulk tape demagnetizers around just for that purpose. Of course, you are supposed to press and hold the button, move to the tape or tool, wave it all around, then move it a meter or two away before letting go of the button, or you’ll leave some magnetization in it. Or let the button go while a screwdriver tip or hammer head is on the business end, and leave it magnetized. Now your screwdriver can hold screws, and your hammer can hold nails to get them started. aperture grille! Thank you for identifying that. I have a buddy who makes art with slumped glass. He was experimenting with the thick front glass from CRT monitors. He ‘popped’ an old Sony TV tube and found a cool metal frame with a row of thin tight wires stretched across it. He threw it on the scrap metal pile and it made an awesome sound so he brought it to me. I added a piezo pickup and amped it. Wow what an ungodly scifi racket it made! That’s an upcycled musical instrument if I ever heard of one – like the ultimate slinky sound effect! Record and post it so we all can hear! I second that motion … in the appreciative hope that you may be so gracious to do so. Unfortunately, I no longer have it. The humidity caused a patch of rust on one end of the wires. It added a bit of buzz, so I left it alone. A few days later some of the ‘wires’ had snapped where the rust was. again, they rattled against the intact wires and made a cool sound so I did nothing. A few days after that I went out to the garage and the whole thing had snapped- all the wires were broken. I imagine that as the wires snapped it increased tension on the remaining wires causing them to eventually snap, increasing the tension even more, rinse and repeat. My only regret is that I didn’t get to hear it when it finally cut loose. It must have been glorious! Maybe I’ll find another Trinitron and set aperture grille up outside with a webcam- kind of like a noisy version of that pitch drop experiment that’s been running forever. Hmmm some history form an old fart! Degaussing wasn’t a “thing” for black and white TV’s but it was used in electronics earlier than color TV. We had tape players very early on. These were the reel to reel tape players that were long before cassette tapes existed. Magnetic tape (including the later cassette tape) would eventually start to magnetize the tape head and this resulted in loss of sound quality so the tape heads we “demagnetized”. There are tools for demagnetizing tape heads and there is also a degaussing wand to demagnetize TV (CRT) screens. So about now you are probable asking – what is the difference between degaussing and demagnetizing? or are they the same thing? Yes and no. degaussing is to remove magnetism – not necessarily to nil. Demagnetizing is to remove all magnetism. 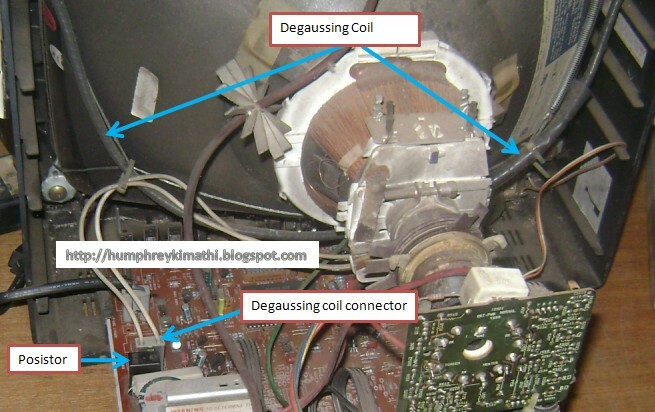 The degaussing coils of a CRT are able to correct for more minor amounts of magnetism. They tend to average out magnetism but not remove magnetic bias completely. It’s kind of like an oily hand print on a window, if you smear the oil over the total surface it looks clean but there is no less oil in total. On the other hand a degaussing wand will remove all magnet bias – ie demagnetize. For the internal coils – the applied voltage reduces as the PTC heats up. By contrast here is how to use a wand. Stand 2m away and press the on button. Walk over to the set and wave it around the edge of the screen in a circular manner then continue this pattern as you *slowly* move back to 2m away where you can release the power button. A hand wand has much more power. This means that it can drive the tube into magnetic saturation. As you move away the effective magnet force reduces as an inverse square relationship to the distance away. So by driving the tube into saturation and then decreasing the alternating magnetic force until it has no effect, will leave the tube at the zero bias (demagnetized) state. Degaussing became a thing in the 1960’s. It’s rumored that colored iron filings were used with experimental magnetic fields to create many of the psychedelic patterns that we associate with this era. Around the same time an experimental perception enhancing drug named lysergic acid (LSD) became commonly used in the perception that it was intelligence enhancing. It made it’s way into pop culture with songs like “Lucy in the sky with diamonds” being a code for LSD. Unfortunately this drug was not intelligence enhancing and many who know those who experimented with this in the 60’s can tell they the experimenters did not return in a meaningful way. They are physically here but somehow they are still mentally lost in the 60’s. This presented a huge challenge for society as the mental health costs alone would be insurmountable. In the 70’s it was discovered that these people lost in the 60’s could function normally if they were occasionally exposed to images from their past drug experiences and hence the government mandated that all CRT’s have a psychedelic mode and these people were then often seen fleeting from one monitor to the next during work. Now that time has passed, all these people have been promoted out of harms way and retired so we didn’t need this same psychedelic mode on LCD. Hahaha!!! You win man, the ending was hilarious. Of course not, you can still get the original psychedelic mode on LSD. ;-) I have been told, it is still available, if you look at the right places. On magnets VS computers. Circa 1998 I was working in a computer shop. One morning I come in and the boss says there’s a PC in the back for me to fix. The customer called him up the night before and he went there after hours to meet the owner. I went into the back and upon seeing the computer I busted out laughing. The entire motherboard side of the case was covered in magnetic business cards. I peeled them all of then hooked it up, all fine, not a problem. Turned out that every other time the owner had taken it to a shop to figure out what was wrong, he’d remove all the cards, then put them back on when he took it back home. Just happened he was in a bit of a hurry that day and didn’t have time to take them off. I told him to put the cards on his refrigerator. Normally the steel case would shield against such small magnetic fields, but when you cover the whole thing, it makes the side of the case like a large magnet, with a field able to reach the short distance to the motherboard and mess things up a little. No charge for the ‘fix’. I call BS on that. Magnetic business cards are very weak and have a pattern of N-S magnetization applied in a Halbach Array. You can feel it by taking two refrigerator magnets and sliding the black side against each other, they’ll jump as they alternately repel and attract each other. Now slide the business card sides against each other, or try to stick it to the fridge by the business card side. They are so weak that even a short distance serves to attenuate the field enough. A large number of them won’t increase this. The steel case would prevent the field from penetrating inside the case. 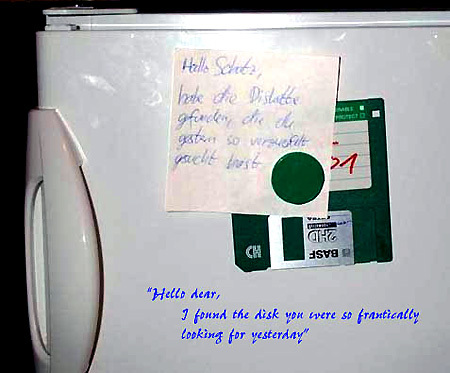 I tested fridge magnets on floppy disks. 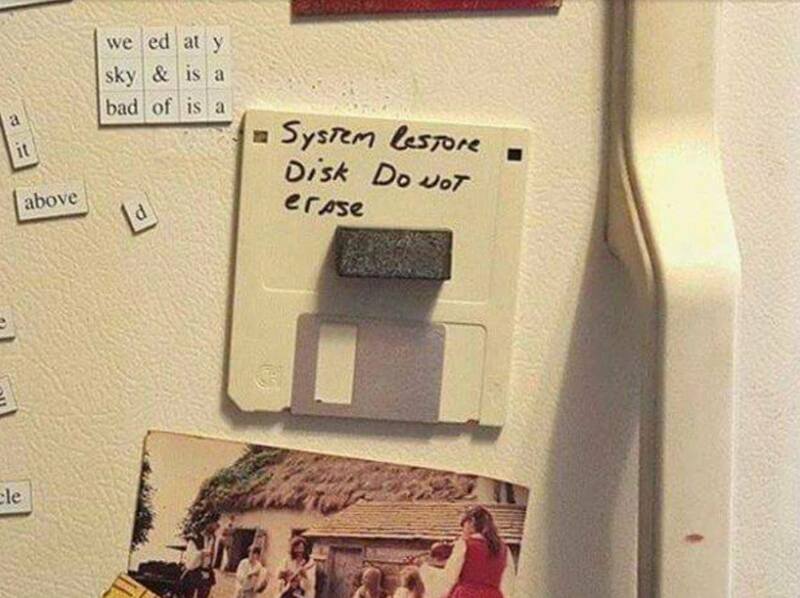 Even a DD 3.5 inch floppy seemed unaffected unless I placed the fridge magnet right on the surface of the disk itself. This is only partly true. The process of degaussing needs an alternating magnetic field, but the amplitude needs to decrease over time. If you would just have an alternating magnetic field and then switch it off, it would not work. Please update these facts in your article. Tangentially-related question, can hard disks that’ve been degaussed/demagnetized be reused/reformatted at all? They usually have a servo-track on one platter, right? So, as I understand, once that’s been destroyed there’s no way for the read/write heads to be positioned on the tracks, because there are no more “tracks”…? Old MFM hard drives can be low level formatted. ATA / IDE / SATA drives all rely on servo tracks printed at the factory by a servowriter. Degauss one of those and it goes straight to the e-cycle bin. Was afraid of that… ‘Spose it’s *plausible* some drives could have a mode to be put in for writing that track, but even *if* such thing existed, would probably require intimate knowledge of each model that is usually a trade-secret. And, realistically, now that you mention it, writing such a servo-pattern would probably require finer control than most hard-disks have available (especially when lacking a servo-pattern to begin-with!). I would think a company like that, would make big bucks. How would you like your sensitive customer data erased? Please check one or more boxes. They could send you video of them destroying it as proof. And the cube could be part of an art gallery. BAH! I knew I missed something. Ironically I forgot the one I have actually done! I also thought about maybe unscrewing the cover and inserting a bunch of fireworks… Colorful! Drilled-holes would probably be a faster insertion-method. I should’ve added a microwave oven option as well. Or good ol’ sparky. Put that hard drive on top of a Tesla Coil until it’s cooked. My mum used to bring a 3.5″ floppy home from the office every day with her backups on and she used to complain that every time she made a new backup, she’d need to reformat the disk. I figured out that the magnetic clasp on her purse was wiping it every day she bought it home. Anyone else just thought of it being “that button that makes something look cool”? Actually, the spring is not the degaussing coil. The spring is there to make sure there is a decent connection to the aquadag (conductive coating) on the outside of the CRT. That coating forms a capacitor with the inner coating that is connected to the anode cap to smooth the 15 to 25kV from the flyback. The degaussing coil will be one or two thick loops around the CRT, usually wrapped in black tape. There’s a lot of mysteries surrounding the Sony Trinitron aperature grill…and that faint horizontal wire about a third of the way up the screen. Anyway, when I spotted a bored software person who’d extracteded the long, and powerful, rod magnet from a toner cartridge and was waving it in front of his $3,000 Sony 19-inch monitor, I knew nothing good could come of this. “Look at me, I’m Mr. Wizard!” he squealed with joy. Anyway, as if often the case, the software guy wandered into the hardware guy’s cubicle, with a sick look on his face, wondering if I could “fix” things. Specifically, did I have a degausssing coil. Anyway, the degauassing coil improved things…somewhat. Apparently, he’d either permanently magnetized the grill, or quite possibly physically distorted the damn thing, because try as we might, the colors were never the same.